After this weekend’s 2-1 victory against Blackstones FC, Woodford United ended a run of 65 successive defeats dating back to April 2012. That’s around 100 hours, or 6,000 minutes of football. Two goals from Harry Beckley were enough to see out the away win in the United Counties League (UCL) Division One which is Level 10 of the football pyramid. 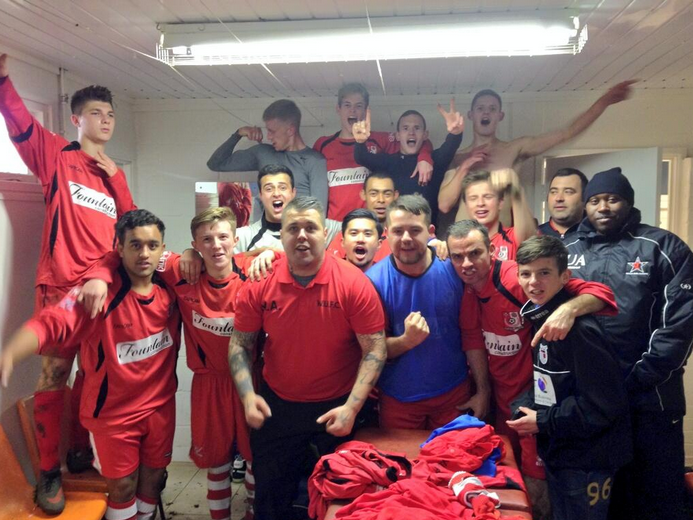 In the words of manager Mitch Austin, “It was like winning the FA Cup!”. Emerging from underground, the first thing that hits you about Wembley is its size, looming impossibly large in the middle-distance, with its craning white arch. Strangely, however, as you approach the stadium it almost begins to feel out of scale, like a dolly zoom warping its 90,000 capacity into a confusingly manageable frame. Unmistakably large but hardly intimidating, the venue, shrinking in stature with every step, fits the occasion perfectly. Once grand enough to occupy a whole date on the national events calendar, FA Cup Final Day is now FA Cup Final Evening; shunted into the primetime TV slot with the early distraction of an afternoon Premier League fixture to contend with. I was a Manchester United fan in stealth mode, attending my first fixture at the new Wembley alongside my City supporting father. Aged four he took me to see Denis Irwin, Paul Ince and Eric Cantona at Old Trafford a number of times thanks to spare tickets gained through work. One of those games happened to be the 9-0 dismantling of Ipswich Town – an experience that painted my impressionable, glory-hunting young mind the colour red.